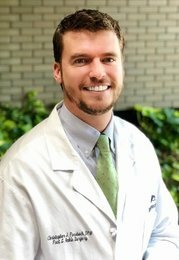 Dr. Christopher J. Forsbach earned his Bachelor's Degree in Biology at St. Louis University in 2009 and went on to earn his Doctorate in Podiatric Medicine from the Rosalind Franklin School of Medicine and Science in Chicago, Illinois. He completed a three-year residency in 2018 in Reconstructive Rearfoot and Ankle Surgery at SSM DePaul Hospital in St. Louis, MO. Dr. Forsbach served as the Chief Resident of his program and tripled the minimum number of required cases to graduate residency. During his residency, Dr. Forsbach received extensive training in foot and ankle surgery including ankle fractures, flatfoot and cavus foot reconstruction, ankle sprains, degenerative arthritis of the foot and ankle, bunions, hammertoes, wound care, pediatric care, and trauma. He now serves as an attending staff member of the residency program in St. Louis. In 2018, he completed a 4-week International Orthopedic Surgery Rotation in Germany, specializing in complex foot and ankle reconstruction. Dr. Forsbach is first-generation German and speaks the language fluently. Dr. Forsbach is an active member of the American College of Foot and Ankle Surgeons, American Podiatric Medical Association, and Missouri Podiatric Medical Association. He is Board Qualified in Foot Surgery and is on staff at Missouri Baptist Medical Center and SSM DePaul Health Center. His focus is on comprehensive patient care and his passion is continuing education. Dr. Forsbach was born and raised in rural west Tennessee. He enjoys spending time with his wife, Caroline, son Christopher, and yellow Labrador, Bailey.